PA#8: great until Friday, pay attention during the weekend! Snowmageddon is continuing. It's snowing in the northern Alps since Tuesday and it's especially snowing today (Wednesday) and Thursday. You can expect another 60-100 cm of fresh snow up to and including Friday. As a result, the avalanche danger in parts of Styria and Lower Austria has now risen to EXTREME. These areas have thus become a NO GO for your storm chase. There is an acute threat to public life with avalanche danger 5. It's better to chase powder elsewhere. There's a code red for large parts of Austria. Do not just get into the car to steer towards the areas with the most snow. Do not just get in the car and drive towards the areas with the most snow (in the forecast). More and more areas have closed parts of the ski area or are completely closed. But those who are well informed and who make the right choices can experience very deep days. And that include NOT going to Styria and Lower Austria. Mild air will make an attempt to reach the northern Alps in the weekend of January 12-13th. This can temporarily cause rain and wet snow. The result is that warmer and heavier snow will fall on a cold snow cover that comes down today and Thursday. A not perfect situation that will temporarily will further unstable the snow cover. The result is a huge avalanche activity. It could be that the weather models will not show the warmth later, but you'd better be warned now than too late. They were begging for some extra snow in the east of Austria in the weeks before Christmas, but now... you know what's going on! A part of the locals (and probably the tourists) are fed up with the white stuff. On the other hand, I see the most bizarre images pass by. It is now so deep in many places in Austria that cliffs that are normally hard to jump have now become great pillows. It's pretty crazy what's happening in Austria now. It will snow heavily especially today and Thursday. The temperature drops with finally snow again deep into the valleys. Have fun during your storm chase now and/or the coming days. Keep thinking! Do not let powder panic take over, read avalanche forecasts, talk to experts and ride conservatively. Oh yes ... and have fun. It does not always have to be really steep. It's quite obvious that the huge amounts of snow are causing a lot of problems. There is still HIGH avalanche danger in the most parts of Austria (source) and that will probably stay the same with the snow that's still in the forecast. And that is also a unique situation. Rarely has there been this kind of avalanche danger for such a large part of the Alps. Same story for the eastern and central parts of Switzerland where the avalanche danger probably will be scaled up to HIGH in the next 72 hours. Keep checking the local avalanche forecast and adapt your plans to it. The advantage of such a large amount of snow is that it eventually becomes easier to settle. Once the snow mass has been consolidated, it could provide a very stable base layer for the rest of the season. The 'old snow problem' that the Austrians had to deal with during the winters of 14-15, 15-16 and 16-17 won't be happening in the red areas this year. But that's not something we have to deal with right now. The avalanche situation is very critical in large parts of Austria. Avalanches already claimed the lifes of two persons on Sunday. Ski tours are not recommended due to current conditions and those who ride above the tree line are in very dangerous terrain at the moment. Simply don't do it. wePowder user akimäkitaipale is using the right words: Still, even it is quite unique now - safety first. Winter has just begun, no point to end life because of that. 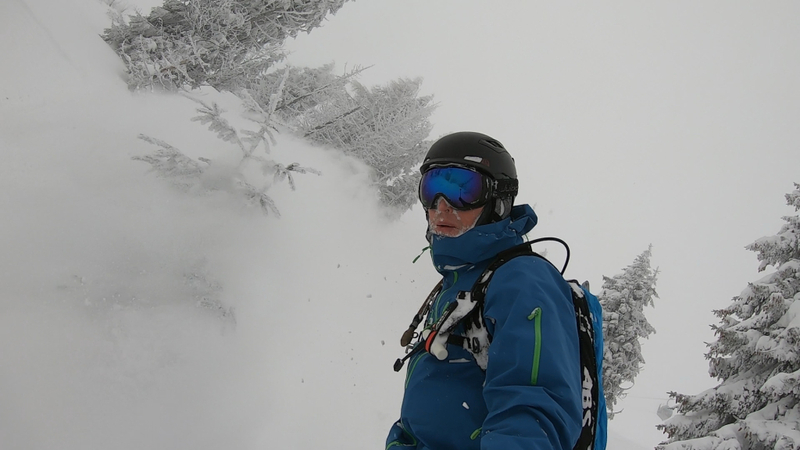 Common sense and the right knowledge can also ensure the most beautiful and unforgettable powder days in this period. The avalanche danger is high, some roads closed and a number of villages are not reachable by road. Nevertheless, you can ride powder. But avoid the ski areas with mainly terrain above the tree line. Again: don't ride above the tree line, it's simply too dangerous! Ride powder between the trees and avoid large open and steep sections. Even steep sections above a forest are dangerous because avalanches can reach far into the trees. Do not choose the deepest destinations and do not forget to have fun. But keep thinking! Knowledge is the key, but powder panic is not. The precipitation will calm down for a while on Friday, but there is another alert on the maps for next weekend. It is not yet clear what the focus will be. Some models hint mainly on the northwest, other models on a combination of northwest and north of the Alps. The most important question is: what will the temperature do and what does this mean for the stability of the snow cover? I hope to tell you more about this later. Thanks, Morris! What are your thoughts on driving from Switzerland to the Arlberg this weekend? Friday-Sunday. Too risky? Thank you Morris! Now I only need to take off work on Friday and find those pillows! One of the craziest, best, fastest #deep Powders of my Life!!! Thanks for the solid level of detail once again Morris. I'll be heading to the monte rosa area on the weekend of the 18th to visit a friend there. Predicted accumulation is ~ 40cm atm in the higher areas (punta indren). How reliable would you say this is and is this weekend likely to bring enough snow for decent conditions to follow? Cheers! Been today in Scheffau. Incredible deep and fluffy snow. Few other powder addicts. First tracks all day long while only using one gondola. My advice for those heading out to the many snow blessed areas: check your choice's lift status regularly. Some areas might happen to close down the whole resort on short notice due to avalanche danger. You might wanna anticipate that in order to not being committed to one valley with no other options.